When I visited West Volusia, I had the pleasure of food tripping during my 3 days, with majority being in DeLand. In fact, there was one day where I went to 7 places for food and drinks with one being an all-you-can-eat restaurant. It always surprises me when a small town has such a big food scene. Much like Georgia’s Downtown Woodstock having over 20 restaurants on its Main Street, the top rated Downtown DeLand has over 24 restaurants ranging from American, Italian and Greek to Latin, Thai and Japanese. But what’s also cool is West Volusia’s drink scene with microbreweries, brew pubs, wine bars and even a small batch meadery, which is very rare to find in cities. 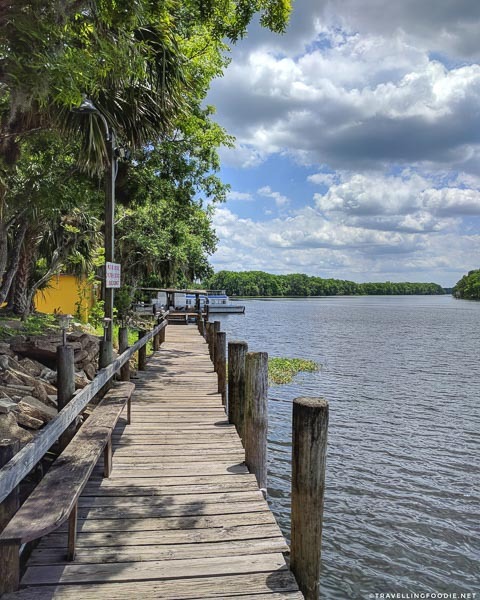 Dining around West Volusia is definitely an experience as it brings its Old Florida vibe of nature and history whether you’re dining at Historic DeLand, or at a restaurant overlooking St. Johns River. 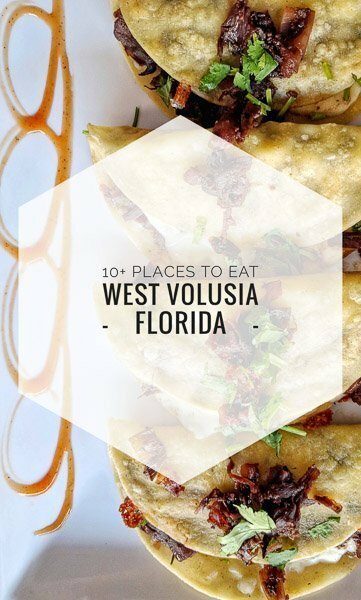 Here are 10+ places to eat in West Volusia including some of the best restaurants in DeLand. 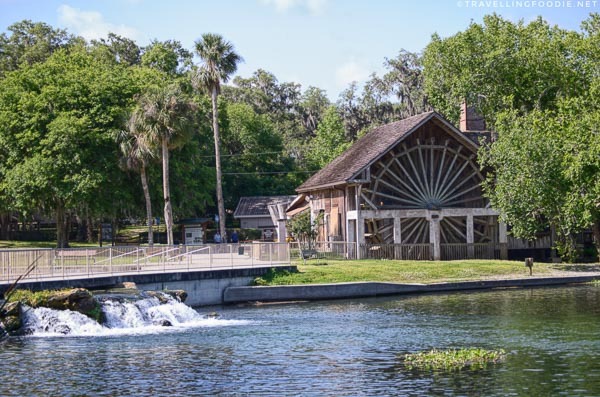 One of the most popular restaurants in West Volusia is The Old Spanish Sugar Mill Grill and Griddle House located inside the De Leon Springs State Park. Did you know? The mill was originally constructed in the 1830’s to crush sugar cane. The Old Spanish Sugar Mill sits beside the spring named for the legendary explorer Ponce De Leon. The restaurant is an attraction in itself because of the popular All You Can Eat pancakes. What makes it unique? There’s an electric griddle on your table top where you cook your pancakes fresh. It’s my first time experiencing breakfast this way! 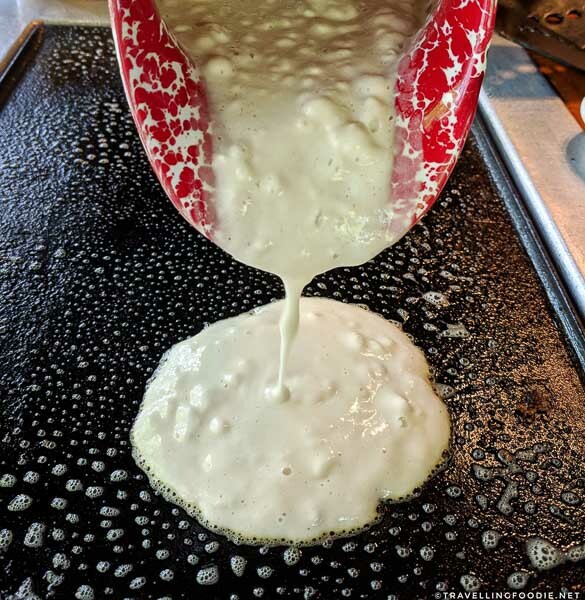 Another interesting thing is they give you two types of homemade pancake batters: Early American pancake batter made with unbleached white flour, and their own unique mixture of 5 fresh stone ground flours (stone-ground corn, wheat, rye, whole wheat and buckwheat). I suggest trying both batters so you can taste the difference. I personally still preferred the Early American pancake since the other mixture had a more gritty texture. But seriously, they had one of the best pancakes I had! They even provide three kinds of syrup: raw honey, syrup, and unsulphured molasses. Again, you should try all three especially the unsulphured molasses which is quite unique. 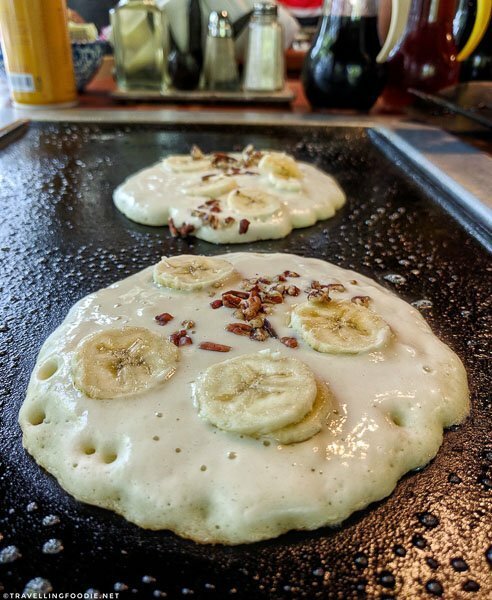 Toppings ($1.95/individual serving) – choices of apples, banana slices, blueberries, applesauce, pecans, “real” peanut butter or chocolate chips. While you’re there, be sure to do the Fountain of Youth Eco/History Tours. Since the restaurant usually has a line-up, it’s a good way to pass the time. The restaurant guarantees you don’t lose your spot on the list if you go on the tour! One of my favourite restaurants in West Volusia was at De La Vega Restaurante in Downtown DeLand. 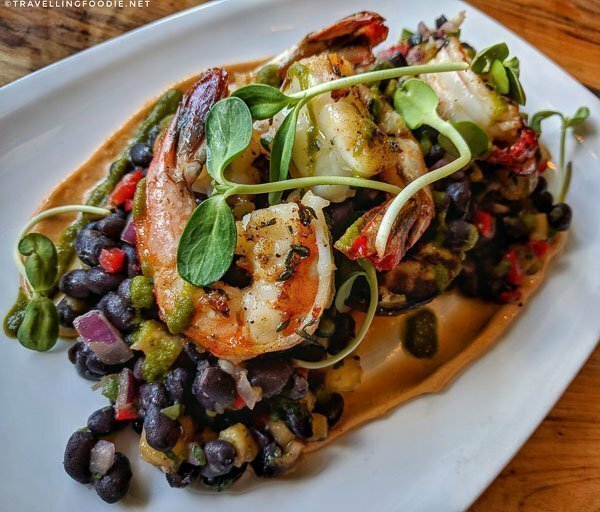 This Latin fusion restaurant has an interesting menu with rich international flavours on traditional items. Did you know? Their menu also serves to fit your dietary lifestyle with a good variety of vegetarian, vegan and gluten-free options. You can sit inside for an intimate atmosphere, or on their outdoor seating. We did the outdoor seating which is perfect for taking photos and for people watching while sipping a glass of their signature Sangria. 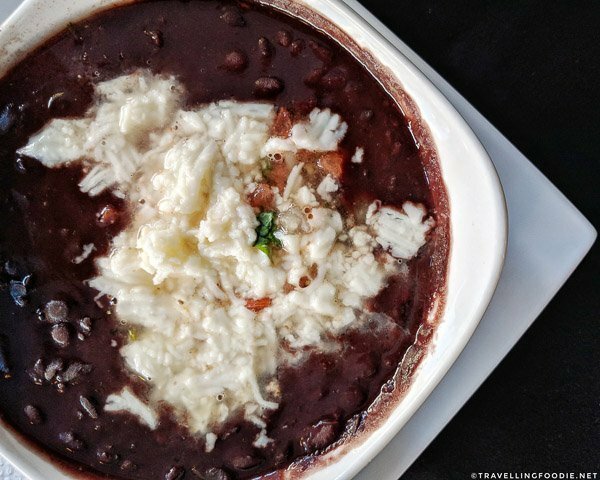 Black Bean Soup ($5) – A healthy, low fat vegetarian black bean soup with tomatoes, onions. One of the most popular Mexican soups is Tortilla Soup, which I really recommend. The soup had a great combination of flavours: sour from the tomato, spicy from the chile ancho mild pepper and tangy from the cheese. I also loved the added crunch provided by the corn tortilla strips as you drink the soup, so make sure you eat it fast enough so the tortilla strips don’t sog. 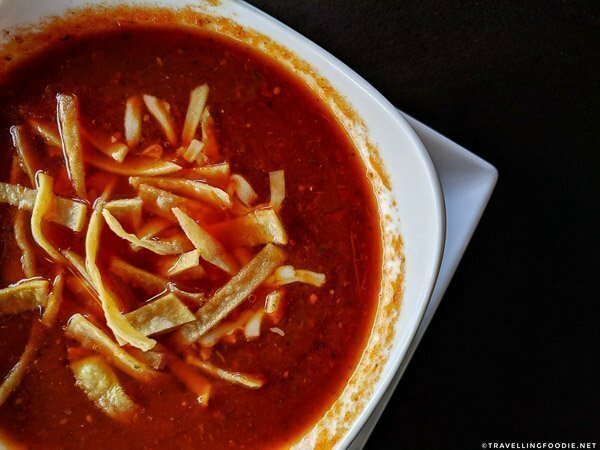 Tortilla Soup ($5) – Crispy corn tortilla strips in a tomato-based Mexican soup with vegetable stock, chile ancho mild pepper, and cheese. The must-try dish here is the Hibiscus Tacos, which is what they are famous for. This was one mind-blowing dish! It feels like you’re eating carnitas tacos but it’s actually a vegetarian taco and what tastes like pork is the hibiscus flowers. The combination of flavours was just astounding! Never had something like this before so kudos to Chef Nora. Did you know? Hibiscus flower is rich in Vitamin C and minerals. They specialize in tapas menu, which includes the tacos. Though the portion of the tacos is good for one person, I recommend sharing so you can try more dishes. 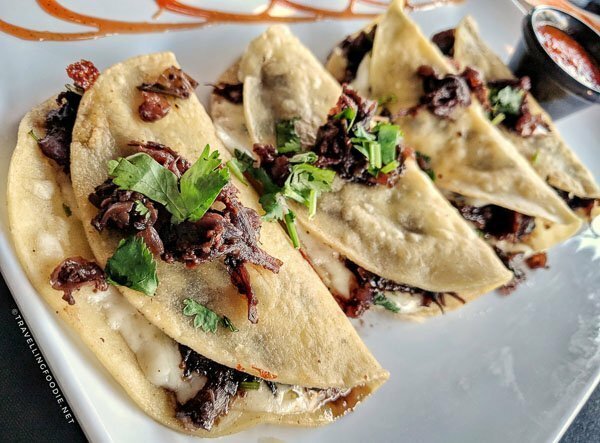 Hibiscus Tacos ($13.95) – four corn tacos filled with hibiscus flowers, green and Spanish onions, cilantro, garlic, and mozzarella cheese, then topped with red pepper sauce. The dishes here prove to be very daring with strong flavours. 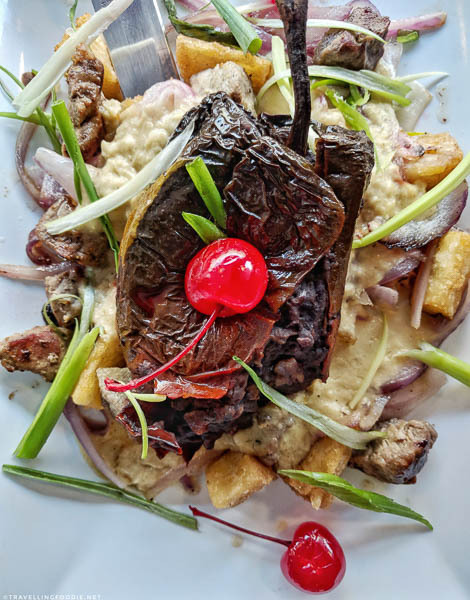 The Chilango Con Carne has sirloin strips with caramelized red onion covered in a creamy white wine sauce then topped with an ancho pepper stuffed with Spanish chorizo and refried black beans on a bed of crispy yucca. It sounds overwhelming, but it just works! 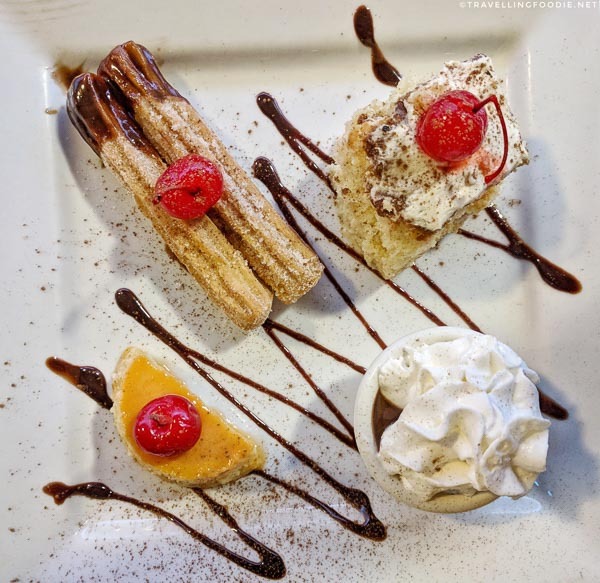 For dessert, you can’t go wrong with the Bite Sampler which includes three of their most popular desserts which are all very traditional Latin desserts. Ask the locals for their go-to restaurant, you’ll probably hear BakeChop. 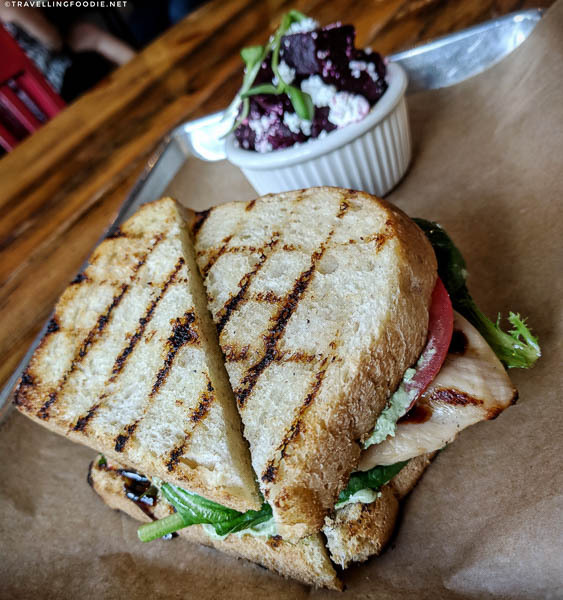 Opened in 2016 by young DeLand entrepreneurs Stevie Vermillion and Taylor Bass, who were 24 and 26 at that time, BakeChop is both a bakery (Bake) and kitchen (Chop) which is a hybrid of strengths of the owners. Stevie was the former pastry chef at Dally in the Alley, and Taylor was the former sous chef there. 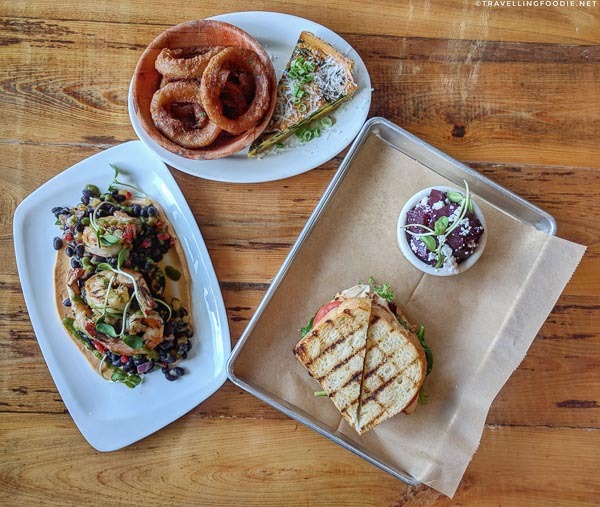 This scratch kitchen uses local produce sourced from central Florida Farmers as much as possible. As a conscious eatery, the meats are all pasture raised, cage free, and hormone & antibiotic free. The interior is very casual, but has a feel of community and sharing. Seating is quite limited so solo diners are best to take the small counter seating under the window or by the open kitchen. I really recommend the Who’s Wanda? dish. It caught my eye when I saw adobo mayo because I came from the Philippines where adobo is one of the popular dishes. The grilled shrimps mixed with pineapple salsa with the adobo mayo really hit the spot. And the grilled half avocado added a nice layer of creaminess. 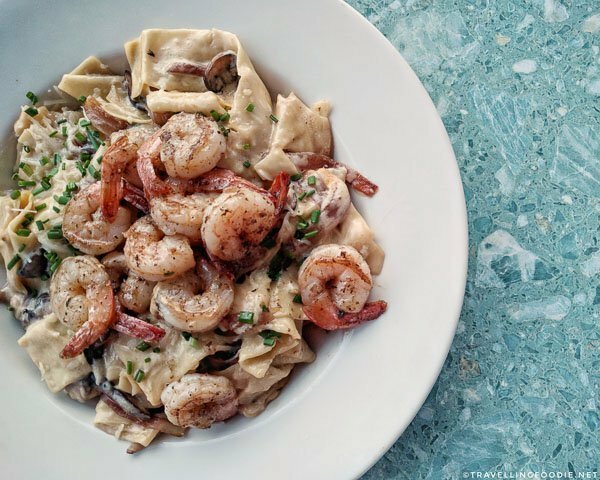 Shrimply delicious! But seriously, who’s Wanda? To try the “Bake” side, you can get the Cue The Quiche which changes daily on the chalk board. The quiches here are big pie style, and an order gets you a slice, as opposed to the small individual round quiches. A slice is actually quite filling already as it is quite thick with lots of ingredients. I loved how flaky the crust was! 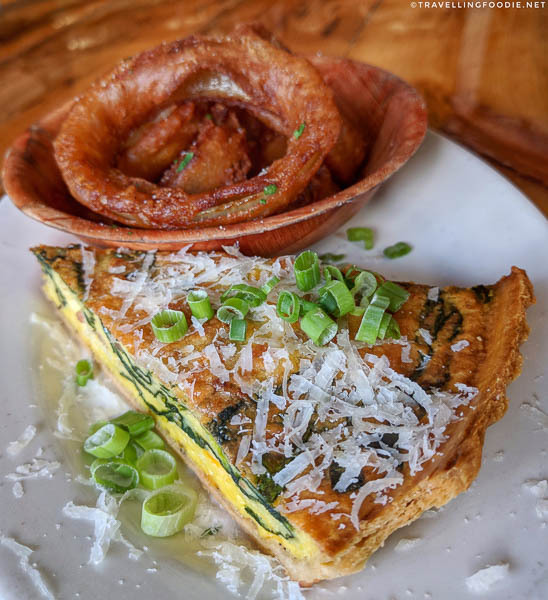 Cue The Quiche ($10) – made daily and serve with house salad, which I changed to onion rings. Check specials board for what’s available. If you’re craving meat, there’s no other place to go to than Pitmasters BBQ! 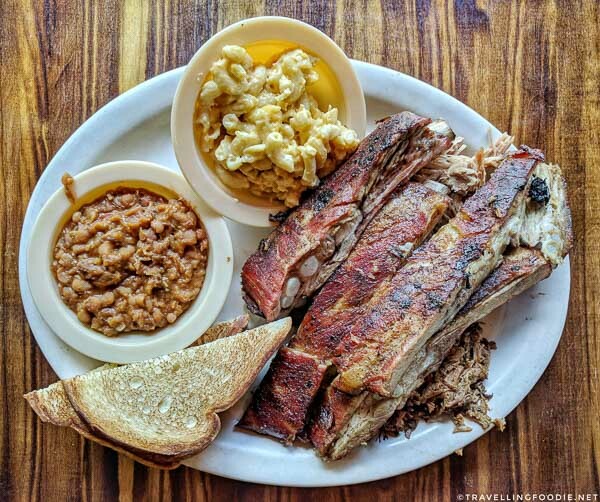 Located between De Leon Springs State Park and Downtown DeLand, you won’t miss Pitmasters BBQ which looks like a bungalow along the highway with a huge sign. This southern style barbeque uses real wood with no gas or electric burners to alter the flavor of our meat. Did you know? They have All You Can Eat breakfast buffet on Sundays from 8am-2pm. The interior feels like being in an old cozy cottage with wood accents. The inside is quite dark so, if you’re looking to take photos, it’s best to be on the outdoor seating. Come hungry because the portions are huge! I got the BBQ Combination For One, but it totally could’ve fed two regular diners. I really loved the ribs as it was very tender and meaty, and the rub was flavourful enough to enhance the taste of the pork without overpowering it. Did you know? They hand rub each piece with their own blend of spices for the right balance of flavor between the smoke, the spice and the meat. 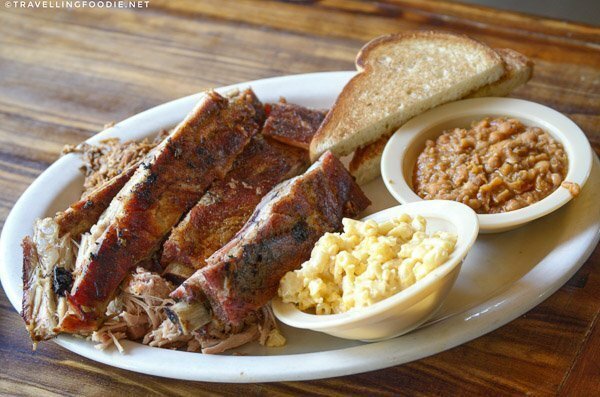 BBQ Combination For One ($14.99) – Large portions of brisket and pulled pork, and two BBQ Ribs (plus two pieces from replaces 1/4 chicken), two regular sides (baked beans and mac & cheese) and one slice of Texas toast. If you love briskets, I recommend getting the Burnt Ends here which is the most tender and flavourful part of the brisket. Be sure to ask for the moist (fatty) part! It’s like BBQ candy that melts in your mouth! 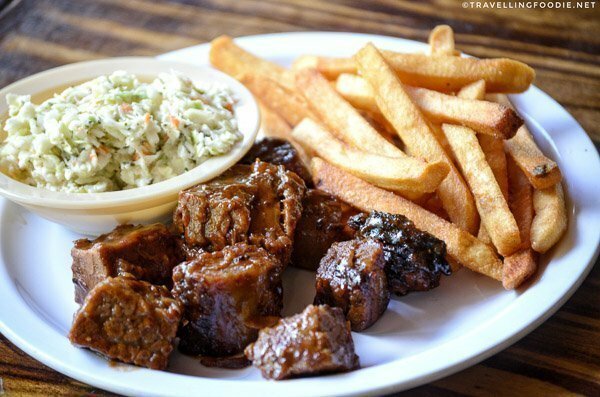 Burnt Ends ($12.99) – brisket combined with their award-winning sweet BBQ sauce. Served with French fries, coleslaw and Texas toast. If you ask locals about long-time favourite restaurants, you’ll likely hear Byte, a modern bistro. Though the restaurant opened in 2013, twin brothers Frank and Bill Jennings are known in the community for being in the restaurant business in DeLand for over 25 years. Did you know? Their former restaurant, Frank’s Brickhouse Grill, which opened in 2000 and just right across the street from Byte, has closed to be converted to a banquet venue. 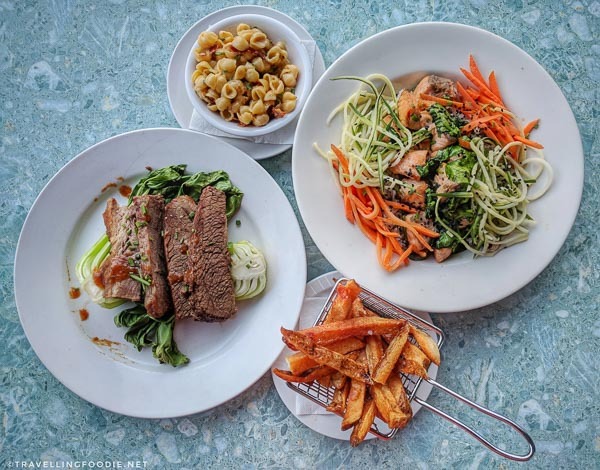 According to owner Bill, Byte’s mission is simple: “casual, modern, fresh”. Their menu has a modern twist on food. I love that they have an open bar that serves right outside the restaurant. The inside is casual intimate which is good for a date night, but can be quite dark if you need to take photos. There’s also another bar inside past the dining area if you don’t want to sit outside. A must order at Byte is their Gouda Bytes. 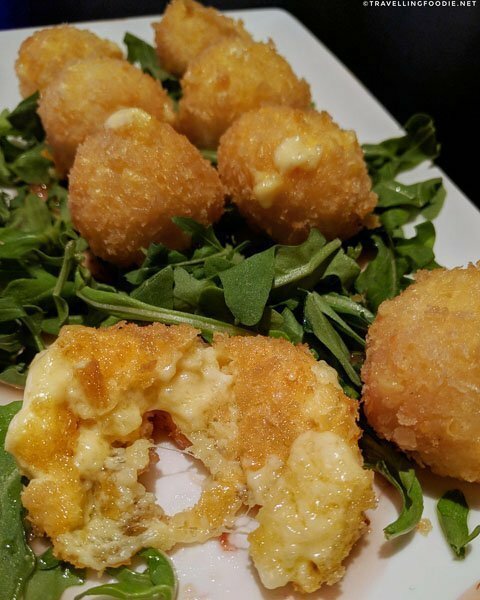 As you bite through the crispy shell, you’ll be greeted by strong flavours of ooey gooey smoked gouda inside. It’s sooo gouda! Travelling Foodie Tip: If you find gouda quite strong, be sure to add the guava gastrique and cilantro on your bite as it changes the flavour profile. The gastrique balances the gouda by adding a touch of sweetness, and the cilantro adds a fresh citrus-like taste. 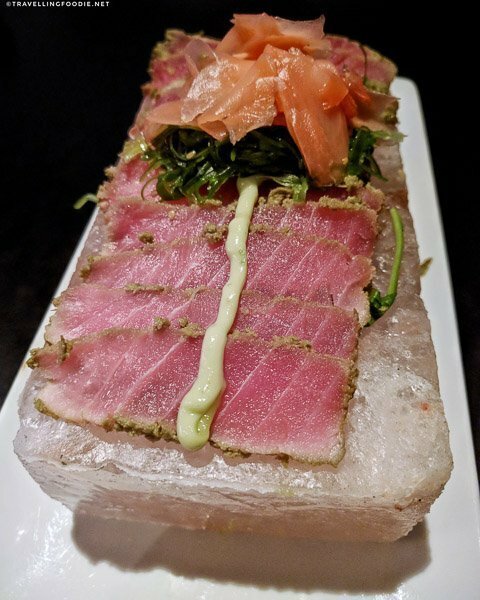 If you like seafood, the Ahi Tuna is Japanese-inspired with its use of wasabi, wakame and pickled ginger. The fresh Ahi Tuna was served on a salt brick which I found quite unique in presentation. For my main, I had the Wild Mushroom Pappardelle which I quite enjoyed. The marsala cream was the winner here, and I loved the inclusion of herbed truffle oil. Shrimps and wild mushrooms were good and quite generous as well. Depending on your noodle preference, the pappardelle wasn’t as al dente as I would like it to be. Travelling Foodie Tip: Sit at the small covered patio to enjoy beautiful views while dining! And if you’re looking to enjoy the river after, Shady Oak has a bait-and-tackle shop next door where you can buy bait or rent a boat to cruise the river. 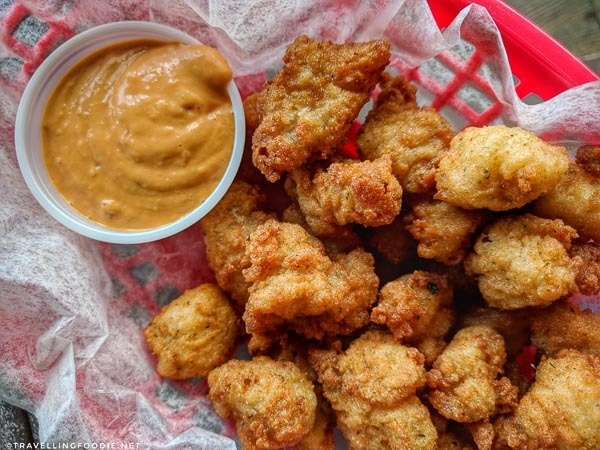 It’s not common to find Gator Bites, which I recommend on getting. The bites were bite-sized like a popcorn chicken. It was juicy and tender, and went so good with the house dipping sauce. A popular item here is their Shady Oak Sampler which lets you choose three or four options from a selection of items. It’s great for sharing, or sampling multiple things. I highly recommend getting the Catfish. 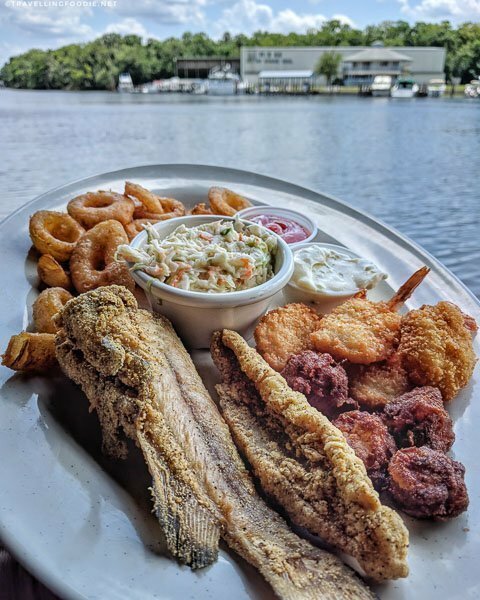 They get their catfish from Sanders Fish House in DeLand, which catches them fresh from St. Johns River. I suggest getting the Catfish Fingerlings, which are young catfishes, because their meat is sweeter than the Catfish Fillet which comes from the adult catfish. 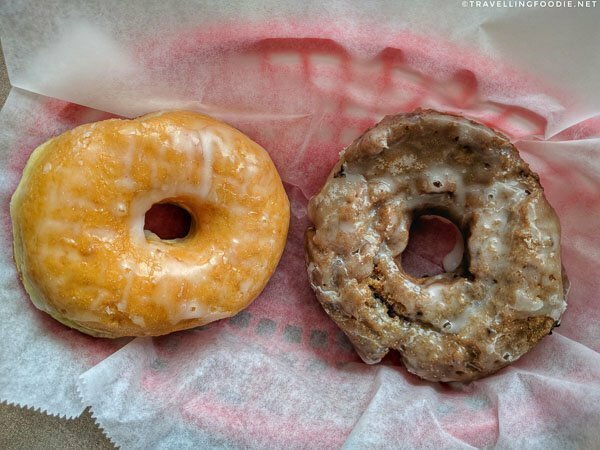 If you’re looking for breakfast or desserts, Mr. Bill’s Donuts & Sandwiches is one of the best options. This family-owned shop has a retro feel of old donut shops, and you can’t miss the cute mascot. 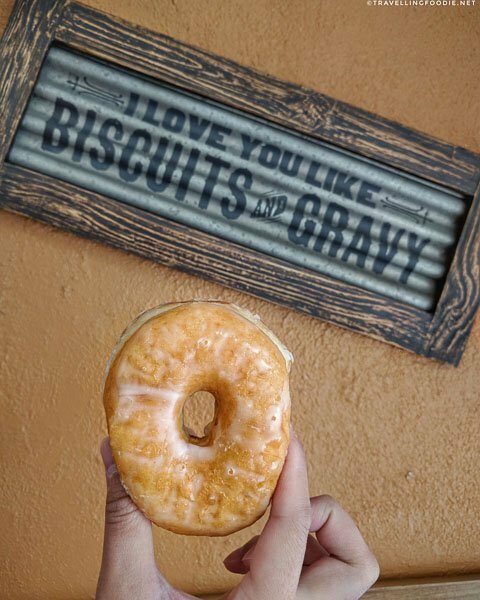 This is DeLand’s only Handmade Donut shop so you definitely want to try their donuts. You can choose between classic and premium donuts from the counter. They are also known for their breakfast sandwiches. I liked the fact that you can choose which pastry it came with: English muffin, bagel or croissant. 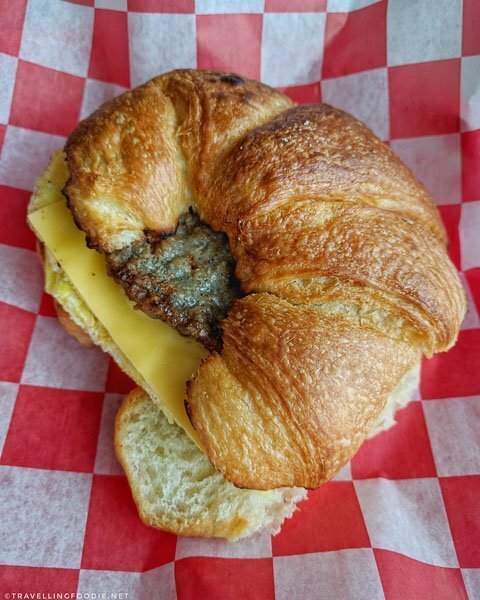 Since they’re known for their fresh baked goods and I love croissants, I went with the Sausage, Egg and Cheese Croissant Sandwich which was pretty good and filling. If you love Key Lime pie, you don’t need to go to Key West, Florida for it. 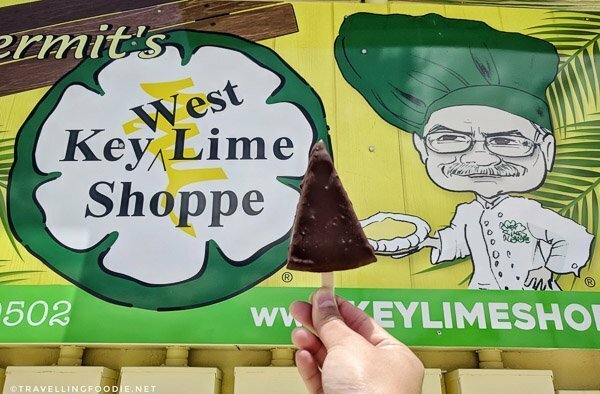 One amazing thing I learned is that DeLand is home to the manufacturing and distribution facility of the famous Kermit’s Key West Key Lime Shoppe! Did you know? Overnight internet pie orders are shipped from this location. This location of about 10,000 sq. ft. has a kitchen, bottling facility, offices, and showroom, which showcases various products that uses Key Lime including peanuts, salsas, candies and even soaps and shampoos! 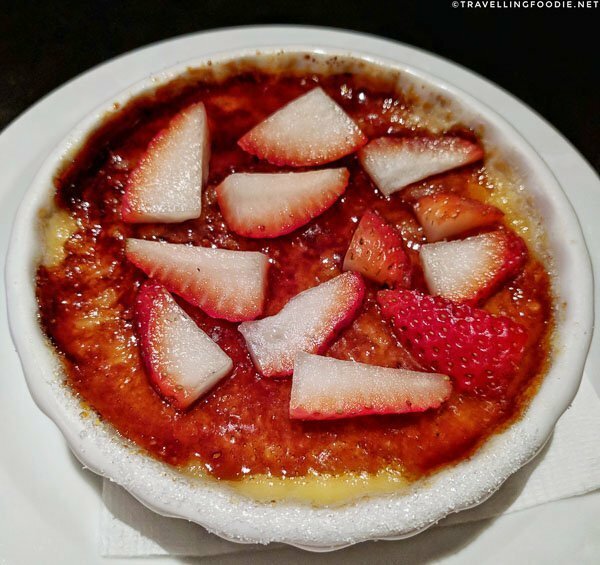 Travelling Foodie Tip: You get 20% off Key West pricing every day. One thing you’ll want to try, especially on a hot day, is Kermit’s Famous Pie on a Stick dipped in Chocolate. It’s so refreshing! If you have a sweet tooth, you’ll definitely want to check out Pat & Toni’s Sweet Things, which reminds me of Jacksonville’s Sweet Pete’s Candy. If you’ve heard the phrase “like a kid in a candy store”, this is what it feels like being here. Did you know? The shop was previously called Candy Castle. The shop smells of sugary goodness. They have a wide selection of sweet things including classic candy selections from Now & Laters and Sugar Daddys to Big League Chew bubble gum and Gummy Bears. They also have a section dedicated to just chocolates, and you can even watch the chocolate making happen behind the counter. 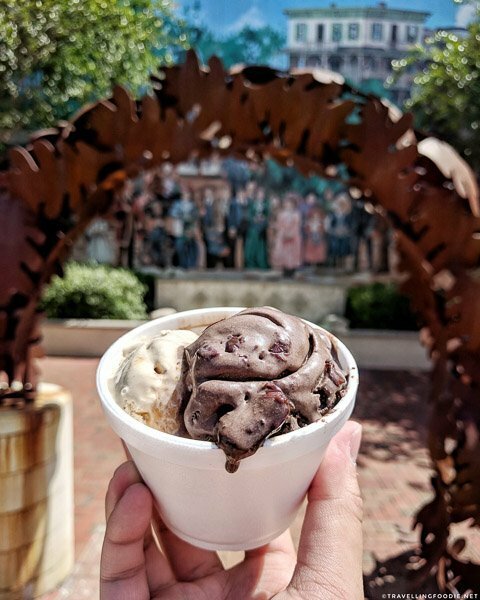 To top it off, there’s also a separate area for ice cream and milkshakes, which are great to have while strolling historic downtown and checking out The DeLand Mural Walk and Sculpture Walk. If you want a combination of city and food tour, the Great Tasting Tours is what you should do. This locally owned business was started by husband and wife team, Larry and Robin French. 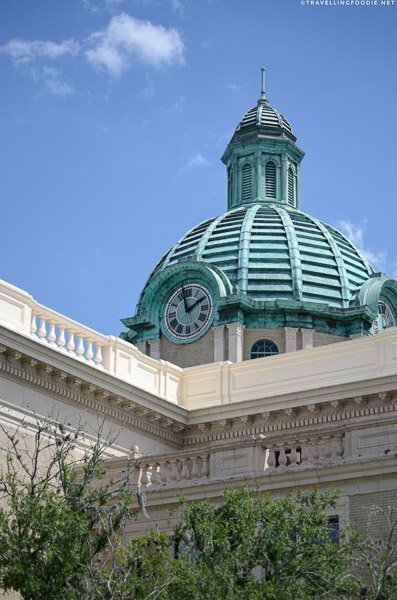 With so much history in downtown DeLand, it’s great to learn about the city’s history while food tripping your way to some of downtown DeLand’s best restaurants and beverage purveyors. 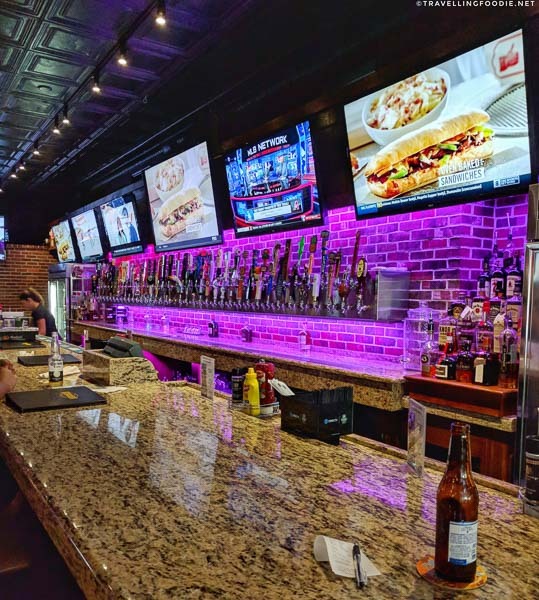 As I mentioned, the drink scene in DeLand was quite surprising so, if you’re into drinks as well, the Brews N Browse Tour by Great Tasting Tours would be the perfect fit as you’ll get to try all kinds of drinks in this tour, along with some food pairing. My tour guide that night was Larry himself, who has such an expert knowledge of the city having done tours and living history for over 43 years and is a historical novelist with a published book called the “Grand Hotels of West Volusia County”. During the tour, you will learn about history, arts, restaurants, culture, and, if you have anything in mind, just ask him (or your guide)! Did you know? DeLand was founded in 1876 and named after its founder Henry Addison DeLand. DeLand was once called Persimmon Hollow because of the abundance of wild persimmons that grew in the area. 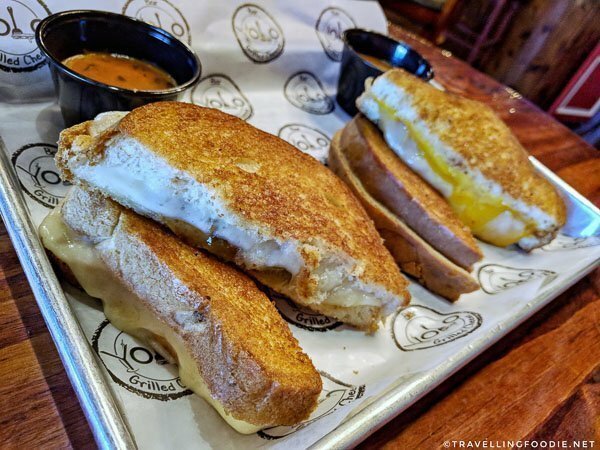 Our first stop was Yolo Bar & Grilled Cheese. Living up to its motto: “Eat like a kid, drink like a king”, this modern comfort food and cocktail bar offers a unique selection of grilled cheese sandwiches and an extensive drink list including classic and original cocktails made with fresh juice squeezed in-house daily, over 100 whiskies, 20 beers on tap, 30 beers in bottles, and red, white and sparkling wines. We started off with the Texas Mule, a refreshing cocktail with Deep Eddy ruby red grapefruit vodka with fresh lime juice and ginger beer. This was followed by a platter with The Standard and The “DeLandite” signature grilled cheese sandwiches along with sampling size of their tomato basil bisque bowl. 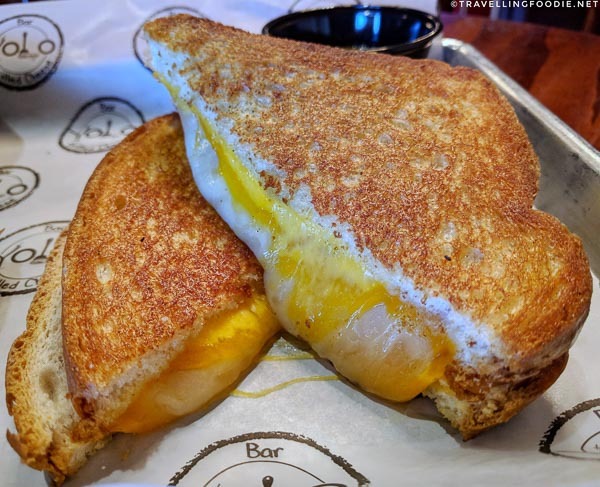 If you love grilled cheese sandwiches, you’ll really enjoy their offerings. I was most surprised with The “DeLandite” with the fig preserve and Havarti because the combination of sweet and savoury just works. I recommend trying this. We had another cocktail called the Smoked Oregon Trail Old Fashioned which I really loved! The smoke definitely made such a huge difference. For desserts, they have “Bulleit” Bourbon Balls which are dark chocolate truffles with vanilla cream center infused with a strong taste of 10-year Builliet Bourbon. Our next stop was at The Elusive Grape which has been serving since 2003. The inside is a combination of a nice gathering place to relax with friends over wines, and also a wine store. There’s nothing elusive with their wine selection as they have 500 different wines from around the world, including rare and collectible vintages. Did you know? If they don’t have a particular wine you want, you can even have them find it for you. In this stop, you’ll get your choice of beer or wine. Third stop was The Half Wall. This brewery and bar boasts 76 craft beers on tap and 23+ HD televisions making it a great spot for sports and craft beer enthusiasts. They make their own beers, and you’ll get a small tasting portion of your choice from their House Beers: Half Wall Blue Trailer Blonde, Half Wall Jefficus Bourbon Coffee Vanilla Oatmeal, Half Wall Stugel Flugel. If you’re into light tasting stouts, I recommend the Half Wall Jefficus Bourbon Coffee Vanilla Oatmeal. 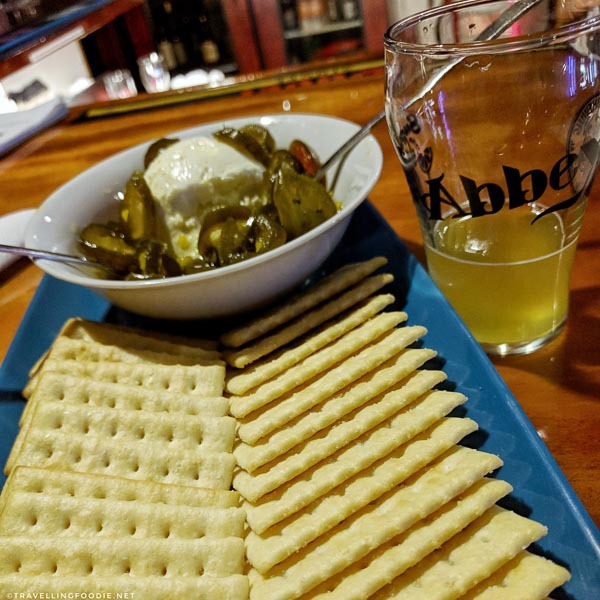 Our fourth stop was Abbey Bar, a craft beer bar that has won numerous awards including Imbide Magazine’s Top 100 Beer Bars in America, Ratebeer’s Top 20 Beer Bars in the World, listed on 100 Bars to Visit Before You Die. This is my first time being in a bar that’s also a meadery. Abbey Bar has partnered with Odd Elixir MeadWorks, Volusia County’s first and only meadery, to produce meads from Florida’s local honey producers like Webb’s Honey and Fredrickson’s Apiary. Here we sampled two of their meads. The Abbey Normal is made with Florida Wildflower Honey from David Webb, and the Lim*E*rick mead is made with Key Lime. I really enjoyed the Lim*E*rick because the key lime added a nice sour taste to balance the sweetness of honey. We also got to sample their Cowboy Candy which was a surprising treat with cream cheese in sugar glazed jalapenos. On the way to our last stop, we made a pit-stop to the popular #DeLandWings, created by artist Erica Group. 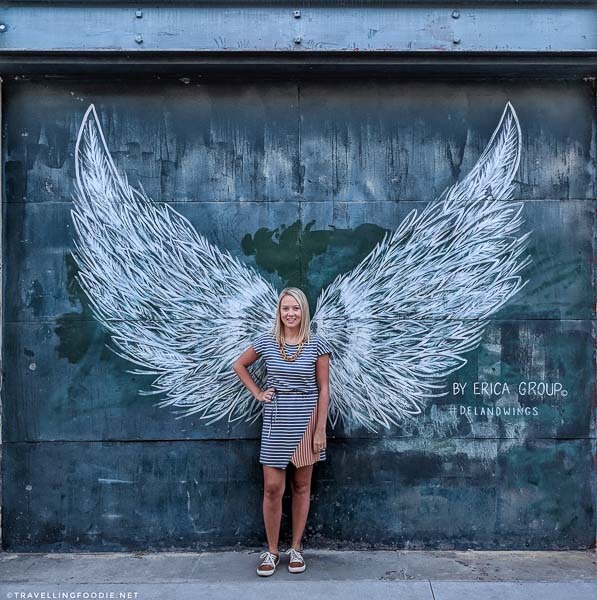 Located behind Dressed Boutique and South of New York Market in Persimmon Lane, this iconic wings, which started as a chalk design for a photo shoot, is now a social media sensation. Since then, the county has commissioned Erica to create more Wings murals across the county. 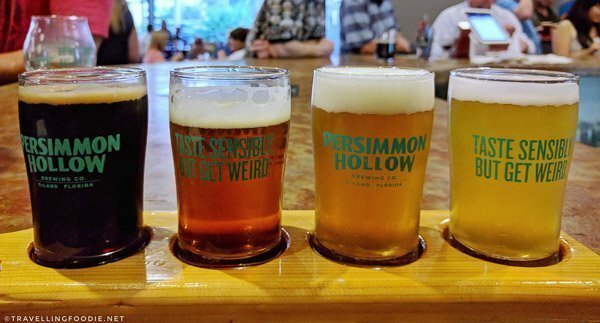 The last stop on our Brews N Browse Tour was Persimmon Hollow Brewing Company, a dream that became a reality in 2014 for two home brewers and best friends, Robbie Carelli and Andy Sistrunk. The most night life I saw in DeLand was here as the place was packed, especially with Stetson University students. Here, you can learn about the brewing process and even get a tour of the brewery. Did you know? They actually have murals depicting the brewing process on the walls outside the building. The murals were done by Erica Group as well! For this last stop, we had a beer flight which they selected. My favourites were the 3 Wise Guys because of its strong coffee taste, and the Daytona Dirty Blonde which was light and refreshing. If you tend to go with IPAs, you’ll enjoy their Beach Hippie. There you have it! 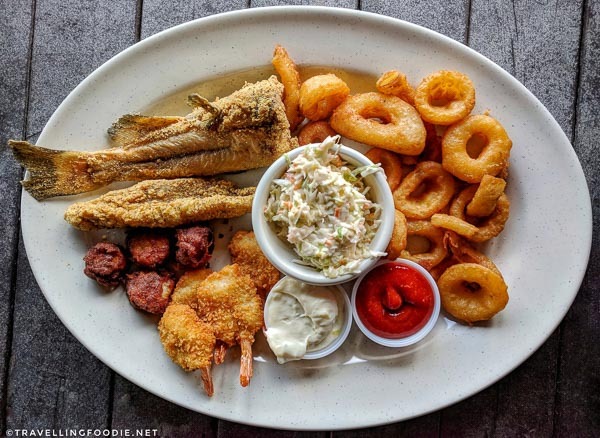 Now you know where to eat and drink in West Volusia, Florida for your food trip! Be sure to follow me on Instagram for food inspirations! 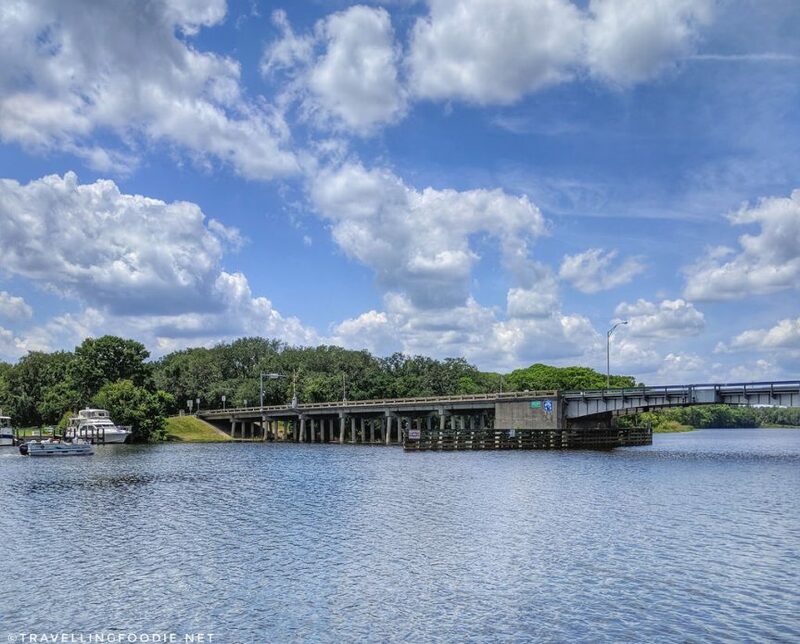 Posted on June 11, 2018 January 1, 2019 by Travelling FoodiePosted in De Leon Springs, DeLand, Florida, Food, USATagged food trip, guides, products, restaurants, sights and landmarks, tours. Great write up on some fantastic places to enjoy good foods and beverages. Thanks for checking us out Raymond. We’re glad you enjoyed your visit!